Copyright: © 2017 Farzana R, et al. This is an open-access article distributed under the terms of the Creative Commons Attribution License, which permits unrestricted use, distribution, and reproduction in any medium, provided the original author and source are credited. Background: Multi-drug resistance among the pathogenic bacteria poses a serious threat to public health. Nanoparticles are one of the most effective therapeutic agents. Zinc oxide nanoparticles (ZnO NPs) are well known antimicrobial agents and are regarded as nontoxic and bio-safe. The present study aims to investigate the antimicrobial effect of ZnO NPs against the bacterial strains i.e. Klebsiella pneumoniae (K. pneumoniae) and Escherichia coli (E.coli). Methodology: The antibacterial activity was performed by Kirby’s Disc diffusion assay using different concentrations (0.2, 0.4, 0.6, 0.8 and 1.0) mg/ml of ZnO NPs with and without β lactam antibiotics (Ciprofloxacin and Imipenem). The Minimum inhibitory concentration (MIC) was evaluated through the standard agar dilution method. Antioxidant potential of ZnO NPs was analyzed through αα-diphenyl-β- picrylhydrazyl (DPPH) radical scavenging activity while the Cytotoxicity of ZnO NPs was evaluated through Brine shrimp lethality assay. Results: The results revealed that the highest zone of inhibition was more in K. pneumoniae i.e. 27.2 mm as compared to E.coli i.e. 13.2 mm. The MIC value for K. pneumoniae and E.coli was 0.05 mg/ml and 0.08 mg/ml respectively. Antioxidant potential of ZnO NPs increases as the concentration of NPs was increased. However, the cytotoxicity analysis showed the non-toxic effect of ZnO NPs. Conclusion: The results indicated that ZnO NPs possess strong antimicrobial activity and can enhance the antimicrobial activity of some beta-lactam antibiotics. The present study can be helpful to formulate nano-drug conjugates as antimicrobial agents in various fields of medical and pharmaceutical research. Infectious diseases, whether they are intracellular or extracellular, have always been a global problem to public health, causing millions of deaths each year. The discovery of miracle drugs, called antibiotics in the 20th century resulted in sudden reduction of mortality rate and illness . Currently, over 70% of bacterial nosocomial infections in the United States are resistant to one or more of the antibiotics use for the treatment . Resistances in these organisms are mainly caused by enzymes called β-lactamases (beta lactamases) which open β-lactam ring of penicillin’s and cephalosporin’s thereby destroying their antibacterial properties. Plasmid encoded β-lactamases which are capable of hydrolyzing broader spectrum of β-lactam antibiotics than simple parent β-lactamases are known as extended spectrum β-lactamases, they can inactivate β-lactam antibiotics containing oxyimino group, such as oxyimino-cephalosporins like Cefotaxime etc and oxyimino-monobactams like Aztreonam [3,4]. There are number of physical methods that can eliminate or kill bacteria and other microorganisms from every environment like steam, dry heat or radiation and many chemical methods. But these methods are time and energy consuming and can cause many side effects too . By the chemical modification of existing drugs and discovery of new antibiotics, bacterial resistance to antibiotics can be resolved. There is an acute need for more effective and long term solutions to this problem . With the increase in health awareness, many people focused on educating and protecting themselves against harmful pathogens. Nanotechnology has arisen over the past decades. Inorganic materials like metal and metal oxides have ability to withstand harsh processes conditions [7,8]. Nanoparticles have emerged as novel antimicrobial agents owing to their effectiveness in small doses, minimal toxicity and lack of side effects . ZnO NPs are one of the multifunctional inorganic nanoparticles that have many features like chemical and physical stability, effective antibacterial activity as well as intensive ultraviolet and infrared adsorption with broad range of applications [10,11]. ZnO NPs are known to have strong inhibitory and antibacterial effects . Bactericidal activity of such nanoparticles depends upon: 1) Size, 2) Stability and 3) Concentration in the growth medium . The antimicrobial mechanism of ZnO NPs illustrated the direct contact of ZnO-NPs with cell walls, results in destruction of bacterial cell integrity with the liberation of antimicrobial ions mainly Zn+2 ions. Several mechanisms of antibacterial activity of ZnO NPs have been proposed including: (i) the induction of reactive oxygen species including hydrogen peroxide (H2O2), (ii) the damage on cell membrane and interaction of intracellular contents with ZnO NPs. In general, bacterial cellular membranes have pores in nanometer so ZnO NPs have a unique ability of crossing the cell membrane through these pores . Therefore the present study aims to investigate the cytotoxicity, antioxidant and antimicrobial effect of ZnO NPs with β-lactam antibiotics against pathogenic bacteria. Institute (PGMI). All Bacterial strains were identified on the basis of biochemical identification and differentiation tests. Out of which, 2 beta lactamases producing strains were selected i.e. Escherichia coli and Klebsiella pneumoniae. They were Imipenem sensitive and Ciprofloxacin resistant. The ZnO NPs purchased from U.S Research Nanomaterials, Inc. were dissolved in autoclaved distilled water. All the concentrations were vigorously vortexed before performing the experiment. Kirby’s disc diffusion assay was used to analyze the antimicrobial activity of ZnO NPs against K. pneumoniae and E. coli. A single colony of tested strain was grown overnight in nutrient broth medium on rotatory shaker at (200 rpm) at 37°C. The freshly prepared culture, 700 μl of water and 200 μl of culture was taken through a micropipette and dissolved. This diluted culture was swabbed on solidified Muller Hinton agar plates. Sterile filter paper disks of Whatmann filter, 5mm in diameter were used for disc diffusion assay. These blank discs impregnated with (0.2, 0.4, 0.6, 0.8 and 1) mg/ml concentrations of ZnO NPs were diffused. Standard discs of Imipenem (IPM) (10 μg/ disc) and Ciprofloxacin (CIP) (5 μg) were used as a positive while a blank disc (impregnated with water) was used as a negative control, respectively. MIC is lowest concentration that prevents the visible growth of bacteria. Standard agar dilution method was used for estimation of MIC. The optical density (O.D) of bacterial suspension was maintained at 0.8-1. Bacterial suspension having 105 colony forming unit (CFU) ml-1 was added to each Muller Hinton agar plate containing different concentration of ZnO NPs and the growth of the bacteria was evaluated after 24 hrs incubation at 37°C. β-lactam antibiotics i.e. IPM and CIP were selected in the present study. Both these antibiotics were dipped in different concentrations of ZnO NPs. After discs were diffused, plates were kept in incubator at 37°C for 18-24 hours. The zones of inhibition thus formed were measured in millimeters. The maximum values were recorded. All tests were performed in triplicates. Free radical scavenging activity was evaluated using L- ascorbic acid as standard antioxidant. The radical scavenging activity was measured using stable radical, DPPH according to method described by Chan et al. with some modified cations . All readings were compared with standard ascorbic acid (55 ± 0.001). Tests were carried out in triplicates. Brine shrimp lethality assay was used to analyze the cytotoxicity of ZnO NPs by following the protocol of Bibi et al. .
ZnO NPs were able to inhibit the bacterial growth at all given concentrations and creating the maximum zone of inhibition at 1 mg/ml concentration i.e. 27.2 mm in K. pneumoniae (#1) and 13.2 mm in E. coli (#1). The comparison between these two strains is shown in Figure 1 and 2. The minimum inhibitory zones formed at 0.2 mg/ml concentration in K. pneumoniae (#1) and E. coli (#1) strains were measured as 19 mm and 8 mm respectively, as shown in Table 1. Figure 1: Zones of Inhibition formed at various concentrations of ZnO in E. Coli 1. Figure 2: Zones of Inhibition formed at various concentration of ZnO in K. Pneumoniae 1. Table 1 Zone of Inhibition in (mm) of free ZnO nanoparticles against tested bacterial strains. The MIC value of ZnO NPs that inhibit the growth of bacteria was evaluated to be 0.05 mg/ml for K. pneumoniae and 0.08 mg/ml for E. coli. Combined effect of ZnO NPs with β lactam antibiotics i.e. CIP and IPM is shown in the Figures 3 and 4. The zones of inhibition formed are indicated in Table 2. Figure 3: Antimicrobial activity of ZnO NPs against E. coli at 1 mg/ml concentration. 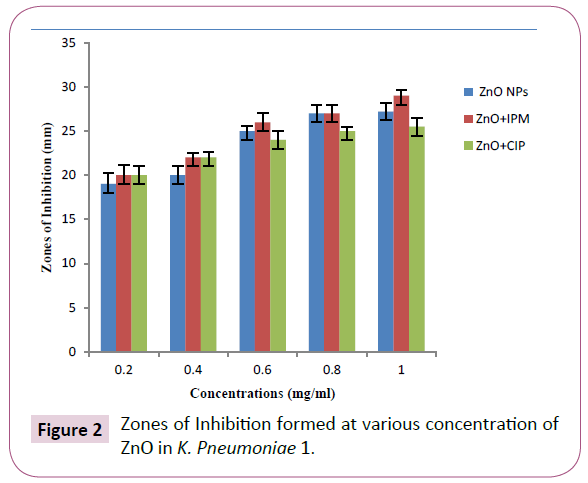 Figure 4: Antimicrobial activity of ZnO NPs against K. pneumoniae at 1 mg/ml Concentration. Table 2 Zone of Inhibition in (mm) of ZnO Nanoparticles with Ciprofloxacin and Imipenem. The results showed the effective free radical percentage as 50% at 1 mg/ml concentration. Brine shrimp lethality test was used to determine the cytotoxicity of ZnO NPs. The average mortality percentage of dead larvae was evaluated to be 0%, indicating the non-toxic effect of ZnO NPs. Our findings revealed that antibacterial activity of ZnO NPs increases as the concentration of NPs increases and maximum inhibitory zone is obtained at 1 mg/ml concentration of ZnO NPs for both strains i.e. K. pneumoniae and E. coli. Thangham et al. reported the same results where maximum zone of inhibition was formed at highest concentration of ZnO NPs . The MIC values evaluated for K. pneumoniae and E. coli were 0.05 and 0.08 mg/ml respectively. Bhande et al. in his study revealed the same results where MIC values for both E. coli and K. pneumoniae were recorded as 0.08 mg/ml and 0.06 mg/ml . All strains were resistant towards CIP but the combined effect of CIP with ZnO NPs showed greater microbial inhibition. The highest zone of inhibition formed by combined effect of CIP with ZnO NPs in strain K. pneumoniae (#1) was 25.5 mm which is greater than inhibitory zone of E. coli (#1) i.e.17 mm. A remarkable increase in inhibition zone of E. coli (#1) was observed where the zone of inhibition formed by the combined effect of ZnO NPs and CIP was 17 mm, even more than the zone of inhibition of ZnO NPs alone i.e. 13.2 mm. Iram et al. investigated the effect of ZnO NPs with different antibiotics against Vancomycin resistant Enterococci and observed that combination of ZnO-CIP showed greater microbial inhibition than the ZnO NPs and CIP alone . The combined effect of ZnO NPs with IPM showed significant decrease in efficiency of antimicrobial behavior of IPM. Similar results were obtained when Nazari et al. analyzed the effect of gold nanoparticles (Au NPs) in combination with fourteen different β-lactam antibiotics against E. coli, Pseudomonas aeruginosa and Staphylococcus aureus. The results showed that Au NPs did not enhance the antibacterial effect of antibiotics at tested concentration . The enhanced antimicrobial behavior of IPM with ZnO NPs was observed in K. pneumoniae (#1). At the maximum concentration of 1 mg/ml, inhibitory zone formed by the combined effect was of 29 mm that is greater than the inhibitory zone of IPM alone i.e. 27 mm. A similar study by Iram et al. tends to support our results, where ZnO NPs showed greater antimicrobial activity with IPM . One of the bacterial isolate E. coli (#3) developed resistance against ZnO NPs and its combined effect with antibiotics. Joshi et al. reported the same result where E. coli developed resistance against Silver nanoparticles (Ag NPs) due to the overproduction of extracellular polymeric substances (EPS), colanic acid that protected the bacteria against Ag-NPs . Results revealed that the antioxidant activity increases by increasing the concentration of nanoparticles. Azizi et al. reported the same result where the scavenging of DPPH radicals was found to be increasing as the concentration of ZnO NPs increases . The cytotoxicity of ZnO NPs against brine shrimp larvae indicated the non-toxic effect of ZnO NPs. A similar study by Ates et al. revealed that ZnO NPs suspension possesses less toxicity . The present study would suggest the possible utilization of ZnO NPs incorporated antibiotics to prevent the fatal diseases caused by pathogenic bacteria. Taken together, this compound as a highly safe and non toxic may be considered for combination therapies against pathogenic bacteria due to its potential antimicrobial effect with important antibiotics. Further study will helpful to formulate nano-drug conjugate as an anti-microbial agent in a large scale level through standardized regulatory conditions. Cohen ML (2000) Changing patterns of infectious disease. Nature 406: 762-767. Webb GF, D'Agata EM, Magal P, Ruan S (2005) A model of antibiotic-resistant bacterial epidemics in hospitals. Proceedings of the National Academy of Sciences of the United States of America 102: 13343-13348. Bradford PA (2001) Extended-spectrum β-lactamases in the 21st century: characterization, epidemiology, and detection of this important resistance threat. Clinical microbiology reviews 14: 933-951. Jones N, Ray B, Ranjit KT, Manna AC (2008) Antibacterial activity of ZnO nanoparticle suspensions on a broad spectrum of microorganisms. FEMS microbiology letters 279: 71-76. Jacoby GA, Archer GL (1991) New mechanisms of bacterial resistance to antimicrobial agents. New England Journal of Medicine 324: 601-612. Taylor PW, Stapleton PD, Luzio JP (2002) New ways to treat bacterial infections. Drug discovery today 7: 1086-1091. Ahmad A, Mukherjee P, Senapati S, Mandal D, Khan M, et al. (2003) Extracellular biosynthesis of silver nanoparticles using the fungus Fusariumoxysporum. Colloids and surfaces B: Biointerfaces 28: 313-318. Sastry M, Ahmad Islam NI, Kumar R (2003) CurrentScience 85: 162. Lara HH, Ayala-Núñez NV, Turrent LDCI, Padilla CR (2010) Bactericidal effect of silver nanoparticles against multidrug-resistant bacteria. World Journal of Microbiology and Biotechnology 26: 615-621. Matei A, Cernica I, Cadar O, Roman C, Schiopu V (2008) Synthesis and characterization of ZnO–polymer nanocomposites. International Journal of Material Forming 1: 767-770. Ghule K, Ghule, AV, Chen BJ, Ling YC (2006) Preparation and characterization of ZnO nanoparticles coated paper and its antibacterial activity study. Green Chemistry 8: 1034-1041. Sawai J (2003) Quantitative evaluation of antibacterial activities of metallic oxide powders (ZnO, MgO and CaO) by conductimetric assay. Journal of microbiological methods 54: 177-182. Raghupathi KR, Koodali RT, Manna AC (2011) Size-dependent bacterial growth inhibition and mechanism of antibacterial activity of Zinc oxide nanoparticles. Langmuir 27: 4020-4028. Li M, Zhu L, Lin D (2011) Toxicity of ZnO nanoparticles to Escherichiacoli: mechanism and the influence of medium components. Environmental science & technology 45: 1977-1983. Chan EWC, Lim YY, Chew YL (2007) Antioxidant activity of Camelliasinensis leaves and tea from a lowland plantation in Malaysia. Food chemistry 102: 1214-1222. Bibi G, Ullah N, Mannan A, Mirza B (2011) Antitumor, cytotoxic and antioxidant potential of Aster thomsonii extracts. African Journal of Pharmacy and Pharmacology 5: 252-258. Thangam A, Pritam S, Ramlakshmi S (2014) Effect of ZnO nanoparticles against strains of Escherichia coli. Asian Journal of Pharmaceutical and clinical research7: 202-206. Bhande RM, Khobragade CN, Mane RS, Bhande S (2013) Enhanced synergism of antibiotics with zinc oxide nanoparticles against extended spectrum β-lactamase producers implicated in urinary tract infections. Journal of nanoparticle research 15: 1413. Iram S, Khan JA, Aman N, Nadhman A, Zulfiqar Z, et al. (2016) Enhancing the Anti-Enterococci Activity of Different Antibiotics by Combining with Metal Oxide Nanoparticles. Jundishapur journal of microbiology 9. Nazari ZE, Banoee M, Sepahi AA, Rafii F, Shahverdi AR (2012) The combination effects of trivalent gold ions and gold nanoparticles with different antibiotics against resistant Pseudomonas aeruginosa. Gold Bulletin 45: 53-59. Joshi N, Ngwenya BT, French CE (2012) Enhanced resistance to nanoparticle toxicity is conferred by overproduction of extracellular polymeric substances. Journal of hazardous materials 241: 363-370. Azizi S, Mohamad R, MahdaviShahri M (2017) Green microwave-assisted combustion synthesis of zinc oxide nanoparticles with Citrulluscolocynthis (L.) Schrad: Characterization and biomedical applications. Molecules 22: 301. Ates M, Daniels J, Arslan Z, Farah IO, Rivera HF (2013) Comparative evaluation of impact of Zn and ZnO nanoparticles on brine shrimp (Artemiasalina) larvae: effects of particle size and solubility on toxicity. Environmental Science: Processes & Impacts 15: 225-233.